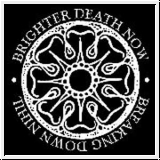 Der Angriff and Indiestate Distribution proudly present a very special 2CD release of one of the most influential and famous power electronics projects in the world, a favourite child of Cold Meat Industry mastermind Roger Karmanik - Brighter Death Now. Recorded live during short Russian tour made in September 2009, it is unique since the lineup was made of Russian artists and only Roger himself was a part of the common European live incarnation of BDN. The persons behind Anthesteria and LamiaVox have joined him in Moscow while the guys from Bardoseneticcube and 414 were together with him on stage in St.Petersburg. The basic parts of the tracks have been sent to them all in advance, so they have prepared their own vision of this material, thus it was nothing like a spontaneous improvisation or jam-session, but pure conceived and well-organized collaboration. Both shows have been recorded on a multi-channel devices, then carefully mixed and mastered, so the final quality is close to the studio one without losing any bit of the raw energy of live performance. The result is a very fresh and unexpected look on the well-known BDN compositions such as "Innerwar", "PayDay" and "Testing" which should be interested not only for devoted followers of the project but for the wider audience of power electronics / death industrial fans. The real gem in our roster, not to be missed! The release is limited to 450 copies and comes in a special embossed foldout envelope with cardboard inner sleeves.